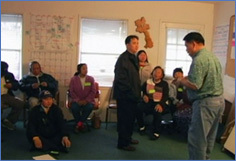 The Laotian community organizes to address health issues in Richmond, CA. In the Action Center section we've included tools such as the Connect Up! database, the Events Calendar, and Inspiring Stories to help you find and reach out to others working for health equity across the nation. You will also find in-depth Discussion and Policy Guides, handouts, and resources for planning events that foster dialogue and action in your organization, community, and classroom. Whether you're a long-time advocate or new to these issues, we hope you'll find something here to help you educate, advocate and organize for health equity. There are many possible ways to use UNNATURAL CAUSES to further your work. In fact, the best approach is a multi-pronged one. The following examples, adapted from the Action Toolkit and supplemented with “how-to” information from the Community Tool Box and UNNATURAL CAUSES companion materials, illustrate a range of ways to work with different audiences to educate, organize, and advocate for health equity. Place Matters Asian Languages Edition: The “Place Matters” episode is available as a stand-alone DVD with English, Lao, Hmong, Vietnamese, Mandarin and Cantonese audio, as well as English and Mandarin subtitles - all on one DVD. To buy the DVD or learn more click here. Internal screening with staff, students, or department heads. Use the series to develop a shared understanding of the distinction between health and health equity as well as the root causes of inequity, and examine the health equity consequences of existing programs and policies. Staff training or workshop for members/constituents. Promote discussion of how the issues depicted in the film reflect inequities impacting your organization or community. How can we develop/renew an organizational commitment to promoting health equity? Dialogue with partners and allies.Take a leadership role in educating partners about how the health equity framework applies to your combined efforts and can advance their work; create a shared foundation and common language for discussing health inequities and aligning your priorities. Do you have a particular policy target in mind? What promising policies and initiatives do you want to highlight? How can people get involved and take action? Mobilize partners. Work with existing allies and partners to build capacity and secure commitments to address a particular issue or set of issues that affect health equity. Use the series to underscore the importance of this work. Build new alliances. Demonstrate to potential partners in different sectors (labor, economic development, education, etc.) how your work is intertwined and how these linkages represent a mutual opportunity; use the series to inform and validate new and unconventional coalitions. Town Hall meetings and public dialogues. Convene public officials, health advocates and workers, community-based organizations, the press, and other stakeholders to draw local attention to existing health inequities, to build support for specific social reforms and promising initiatives, and to generate an eagerness for change. Policy Briefings. Use one or two strategic clips in a forum for government officials and policy makers. Bring in "non-health" issues – policies that can shorten the socioeconomic pyramid, promote racial justice, and protect those lower on the pyramid from health threats. Discuss the distribution of power: who should be seated at the table and how can you make that happen? Support a specific policy target. Use the series to build public will and support for a policy or initiative at the local, regional, state or federal level that advances health equity (e.g., a living wage law, extended bus routes, universal pre-school, or a community benefit agreement). A screening can also help raise the visibility of other news: a promising initiative, report, research agenda, or innovative partnership. Engage the media. Encourage the media to use a health equity framework to report on health issues, to cover innovative local solutions, and to expose social and economic policies in the United States that influence health equity for better or for worse. Check out our Action Toolkit and Discussion Guide for more planning tips and tools. To receive regular updates on the UNNATURAL CAUSES public engagement campaign, sign up for our email newsletter. Questions? Check our FAQ (PDF).